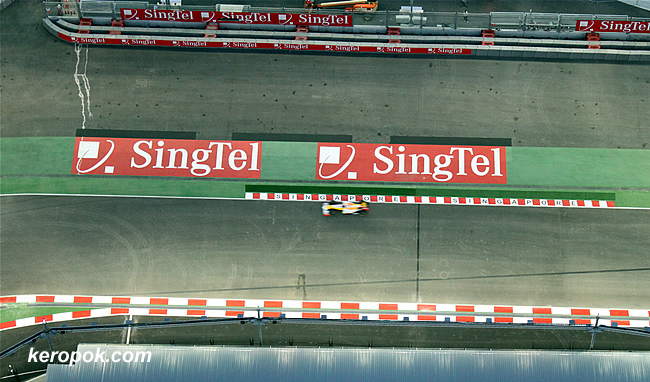 'Boring' Singapore City Photo: F1 from the Singapore Flyer.. Thanks to 24seven.sg, I got a set of Friday night tickets to the Singapore Flyer to view the F1 Practice Race. I am not a professional photographer, so the photo not so nice. I don't have big huge cameras with even bigger lenses like what everyone's carrying tonight. So I can only take blur photos like this. Oops, why do I always take photos of the Renault Team? Recognize the colour? Oh, ING pulled out their sponsorship and ING's logo disappeared from the cars tonight. Aiyaya.... Romain Grosjean's car skidded at Turn 17. The same place where Nelson Piquet crashed his car last year. I think they are practicing how to crash again. Tsk tsk. I was there at the Flyer too ! Nice pic ! Thanks. But I know it's not really that nice. LOL... Looking at those professional's photos, I really pai seh. That's a good pic. Not many take like these.